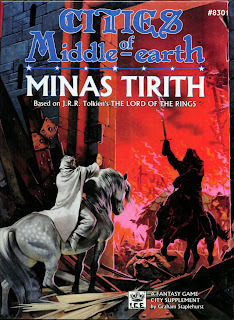 All roads may lead to Minas Tirith, but I'm divided in mind about the city-module approach. It's a vast achitecture of the mundane, which on the one hand is rewarding on an esoteric level, but on the other overwrought for gaming purposes. There's only so much detail required in a "friendly" city, and Gondor's capital could have been satisfactorily covered in a campaign-sized treatment. If this sort of painstaking detail is really required, I'd rather see it applied to a sordid cesspit like Tharbad, a crown jewel like Annuminas, or a primitive wild thing like Edoras. 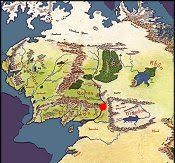 As it is, we got Minas Anor and Minas Ithil. Intuitively they may be logical choices, but more is really less in their cases. It's worth discussing the cover first, which is a splendid Angus McBride piece, but falsely pitched. 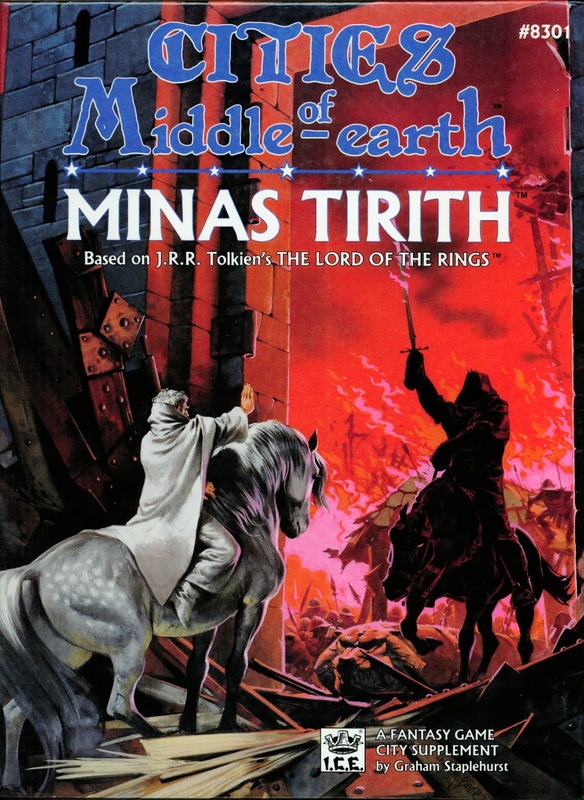 The module isn't set during the War of the Ring, nor at any time when the city was called Minas Tirith. Like most ICE modules, it follows the aftermath of the Great Plague, and thus when it was Minas Anor, and which is in fact what it's referred to throughout the text. Admittedly this ends up not mattering much, since the city doesn't change drastically throughout the Third Age. The stewards take over in 2050, the White Tower of Ecthelion is aggrandized in 2698, the White Tree dies in 2852... But it's still a cheap trick, and foreshadows the outrageous stunt pulled in the next city module which leaves my piles burning to this day. "Minas Anor is, all things considered, a safe place within the empire of Gondor. It sits somewhat smugly below Mount Mindolluin, its citizens well protected, and casting disparaging glances at the folks of Minas Ithil in Mordor's old shadow, or the people of the coastlands that suffer the depredations of the Corsairs. Nothing threatens the capital, for the Sun is still high in the heavens and there is no sign that anything is imminent." Well. I'm not surprised I got very little use out of this product as a DM, even for campaigns that required visits to the city. But for what it's worth, the four-page color insert displays the city's seven tiers, while the other side features a color map of the surrounding provinces of Anorien, Ithilien, and Lebennin. Within the module's pages are all sorts of buildings laid out in unprecedented detail, though I remain underwhelmed by it all. The only places that really grab me are the libraries on the fifth level, the houses of healing and halls of the dead on the sixth, and of course the royal bastions on the seventh. Objectively I have to give Minas Tirith high marks for this layout work, as it excels in what it sets out to do. But despite its colossal ambitions -- it's 160 pages and the only hardcover module I ever acquired for any RPG -- it's something I could live without if I really had to.